The holiday season is almost upon us, and if you're like me, you're already busy making your lists and checking them twice, or you might be fretting over how little time you have to make a list and check it twice. You can't go wrong if you give someone a good book to read: it's one of the best "activities" to bring along on any trip with children. Two fantasy/fairy-tale titles I recommend is Diana Wynne Jones' "Howl's Moving Castle" (the source material for Hayao Miyazaki's famous animated movie), and J.R.R. Tolkien's classic "The Hobbit". Older kids and adults might enjoy Tolkien's "The Lord of the Rings" books as well. If your kids are like mine, drawing and colouring is a great way to get them to spend some quiet time, whether you're on a trip or at home. A set of crayons and markers packaged in a handy bag that turns into an art center when opened up, like the Young Artist Studio Desk To Go , would make a great gift. A good child carrier can be a huge help when you're traveling with kids, or when you're just out and about shopping, hiking, or hanging out at a Christmas market. There are lots of different styles, including the "stand up" Piggyback Rider, and Deuter's line of back-carriers. We used a Deuter carrier when the kids were little, and they were a great help when we were going on flights and had to carry the kids through a big, busy airport. Most of us will definitely be bringing our phones along when we travel, and the QCard case turns your phone holder into a wallet. Very handy for keeping credit cards and a bit of cash close by and in an easy-to reach spot. These "Vs Mittens" are absolutely adorable and would make a great gift for both parents and kids. Each pair of mittens is made to look like two different creatures: dog vs. cat, lion vs gazelle, frog vs. fly, and so on. There are some great socks as well: check out the vs.stuff website for more! This is a kid-proof, kid-friendly educational learning tablet from the LeapFrog company. It works with the company's apps, e-books, games, and so on. It's designed for kids ages 4 to 9. Looks like a great thing to bring along on a flight! 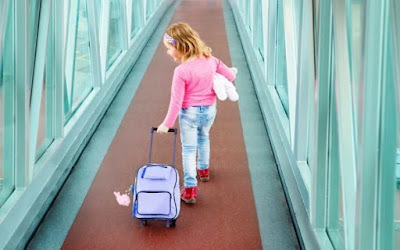 If you're traveling with a baby or toddler, a hook-on chair can come in very handy. It's also good for when you're visiting someone's house and they don't necessarily have a high-chair available. There are lots of different models available, including the Joovy Hook On Highchair . Lots of us need some extra memory when we're traveling, whether it's for documents, photos, or anything else. A USB flash-drive styled as an easy-to-wear bracelet is a great idea and would make a very cool stocking stuffer. I know many people only use their cell-phones as alarm clocks, but for myself, I still appreciate a nice alarm clock that you can easily see in the dark without having to mess around with a phone. There are lots of models available, including the Travel Alarm with LED Light Flashlight and the Lewis N. Clark Nightlight Travel Clock . I just saw this item online recently and I think it looks like a great idea for anyone who travels. To quote the company: the Ride Safer 3 Travel Vest - Booster Seat Alternative is "safe, convenient, easy, portable and comfortable alternative to booster seats and car seats. More convenient for travel and placing multiple children in the same row of a car. Optimizes vehicle seat belt for correct fit and protection for a child. " Safe, easy to carry, and easy to pack - all very good things.